Tom Stefopoulos at HACCM, Original Portlander to put a bird on it? In 2007, Iraqui artist Wafaa Bilal caused an international sensation with a performance called Domestic Tension, where he lived in a gallery constantly shelled by paint ball guns controlled by people far away via the internet. It was a critique of unmanned drones and it also gave the artist PTSD on the way to art world stardom. For Linfield college Bilal will perform a site specific piece called I Don't Know Their Names, an exercise in barely perceivable writing that recalls the way victims cease being individuals and simply become part of an aggregate disaster toll. 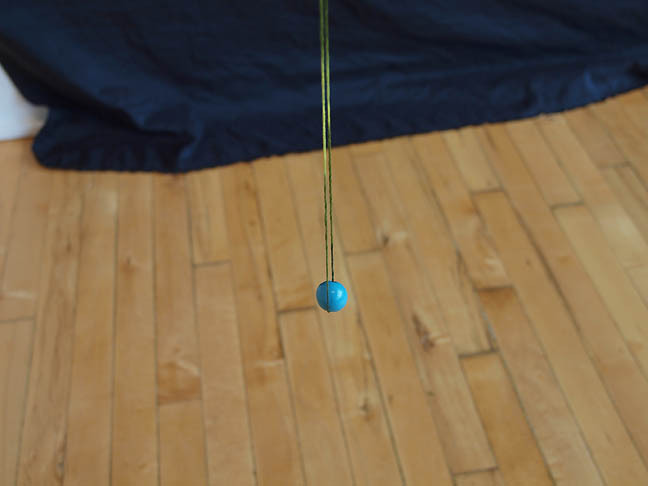 "Bilal will engage in a durational performance daily in the Linfield Gallery, Tuesday, April 1 - Friday, April 4, during regular gallery hours, 9 a.m. - 5 p.m. 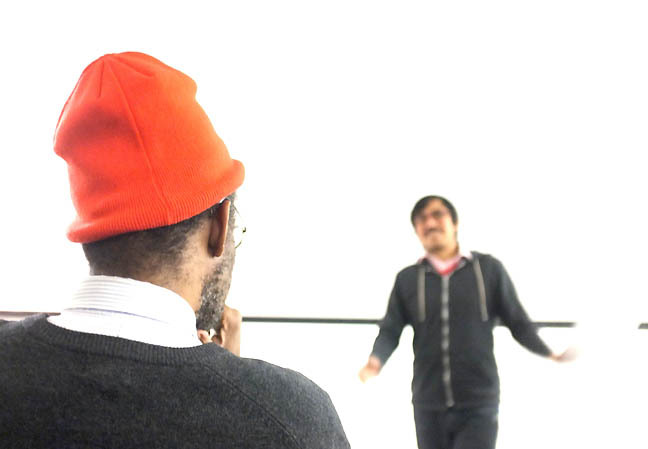 The performance will continue on Saturday, April 5, 12 p.m. - 5 p.m. Gallery visitors are welcome to quietly watch as the artist is focused on creating this site-specific exhibition". You don't hear much about female light and space artists but LACMA's Helen Pashigan show is set to alter that. 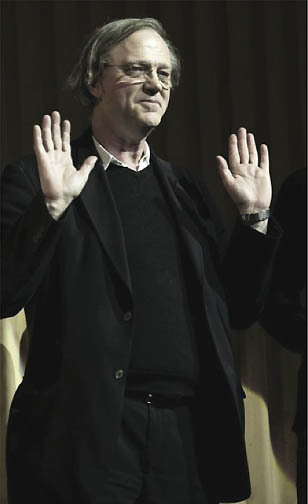 Jerry Saltz takes on an art flipper. The main problem is treating artists as a mere market that is easily cornered, hyped, inflated then turned over like what used to happen to commodities in the 70's and 80's. The thing is Art requires a long term view and a supple aspect that is being lost here. It isn't the market, academia, institutional commitments or critical response... it is all of the above that matter. Also, when attention in any one area is over-inflated it builds resistance from the other corners of the art world. Also, the question of taste isn't being foregrounded... it is the ability to influence and motivate. There is a distinct difference and strong taste tends to justify itself because it has a certain integrity to it. In case you missed it, for the second year in a row Brian Libby chose the venues for the Portland Modern Home Tour. My oh my, has Portland's image and design IQ changed or what? The hoard of Nazi Looted art in Salzburg is far better than at first thought. Jerry Saltz on Finding Vivian Maier. Definitely this is the year when the art world is looking at the contributions of women in a new light. The Guardian shows shocking images of America's race war that you probably wont see in US publications. Hyperallergic on Kara Walker in Eugene. See it, the show ends soon.... the same with the Francis Bacon at PAM (it is the last weekend actually). As predicted 2014 is definitely shaping up as the year women are raising awareness again.... and Yoko Ono's latest project invites all women to participate. 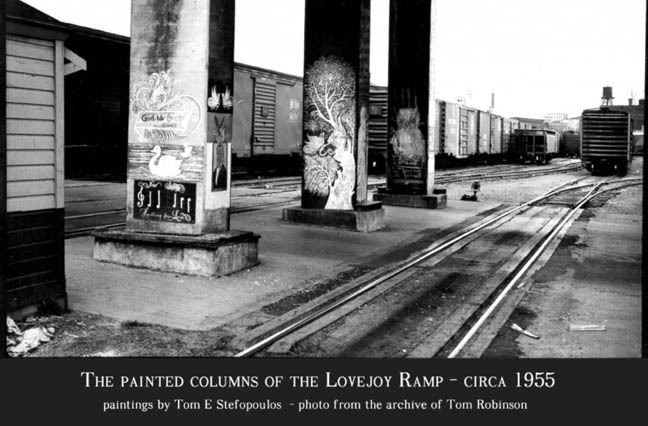 They were still in place in 1999 when I first moved to Portland but for the past 18 years the Friend's of the Lovejoy Columns have been trying to find a way to preserve and find a new home for these historic artworks by Tom Stefopoulos. Stefopoulos was a Greek immigrant who worked for a time at the rail yards that used to be located in the now redeveloped Pearl District and I think it is very important for Portland to preserve its artistic past. The columns appear in the open scenes of Drugstore Cowboy and even appear in musician Elliot Smith's history. When the professional artist, Stefopulos saw the colonnade for the one time Lovejoy viaduct to the Broadway bridge he was reminded of his homeland but he also brought his new world pluck and started an elaborate series of scenes depicting Greek myths and his signature bird designs. His work has an instantly identifiable graphic flair known mostly for his signature birds. In a way he may have been the original Portlander to "put a bird on it" and this exhibition at the Hellenic-American Cultural Center and Museum gives wider context to Stefanopoulos' work as a print maker, master calligrapher and idiomatic public artist. Considering the merely "quirky" public works that Portland has put up in the last decade it would be a good thing to see these historic relics from a bygone era be reinstalled in a new home. They tell an immigrant's story, mixed with Americana, Hellenistic references and a general connection to the culture of the railroads before there was a Pearl District and condos. Filmmaker Vanessa Renwick even has a related video piece in the show so come on out and get caught up on what has been and can be still done. The biggest news in Portland's art scene this weekend was that PLACE has abruptly had its lease terminated by Pioneer Square Mall. PLACE was our pick as the alternative space of the year in 2013. It was always an odd fit, an alternative art space that staged mock suicides or an outright protestation of consumer behavior (like Paul Clay) in a downtown mall, but that is what made it work (and what the Portland 2014 biennial totally missed by being 3-6 years behind the curve). In general it is disappointing but in some ways an ending like this is great... it is better to burn out scalding hot than just fade away and it reemphasizes the crucial nature of these improbable alternative spaces to Portland's overall character... if only Portland's more official institutions would get involved (or actually have curators attend shows) during their short lives. Even the local Fox affiliate got ahold of the story... nothing seems odder than seeing Michael Reinsch's name and fake suicide project on Fox News, but there it is. Hopefully all of the publicity will help PLACE find a new home... perhaps in some place downtown and equally unexpected like a bank? An excellent essay on Victorian occultism and its relevance to contemporary art should be required reading for all artists working today. Lobbyists for major auction houses are opposed to artists and their estates getting a cut of the action in inflated art market... predictable. Shigeru Ban, an architect known for making temporary structures has been awarded the Pritzker Prize. This is significant as his work is often decidedly unmonumental and temporary. Last but not least, PORT welcomes our newest sponsor the Jordan Schnitzer Family Foundation. We are very selective about our sponsors and currently the foundation's generosity has a facilitated a long list of exhibitions it has lent works to such as, the excellent Emancipating the Past: Kara Walker's Tales of Slavery and Power in Eugene, Under Pressure at the Missoula Art Museum and Radical Repetition at the Whatcom Art Museum. The Jordan Schnitzer Family Foundation has an encyclopedic collection of master prints and Northwest art that it lends to venues around the country. In particular, they make exhibitions and support programs available to communities that often would not have access to such work. Built to share, the collection was one of the first large scale lending libraries in the USA, leading the way for other collectors like Eli Broad and Nicolas Berggruen. In 2012, the Jordan Schnitzer Family Foundation lent an encyclopedic survey of Ellsworth Kelly's prints to LACMA. That show later traveled back home to Portland. In the Twentieth Century artists started obsessing about the life of objects like no time in history. It was a confluence of ideas from the East like, Buddhism, Shintoism, Taoism and Tahitian etc.. as they mixed with emerging late 19th century European ideas around property and industrialization. It created an anxiousness within very distinct world views that made a sense of the avant-garde possible. 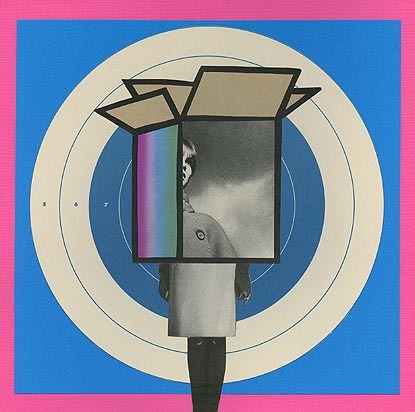 With Kandinsky there was a sense of active engagement with the viewer akin to music, Kurt Schwitters turned stuff into an environment, Picasso and Braque used collage and eventually Robert Rauschenberg created combines to made art out of anything (we can credit Dada and Arte Povera too). These developments lead to a heightened sense that some objects had an active life as a presence or art and some became a precious artifacts, both venerated and dead. Of course there are many shades of gray in between the two polarities of active object and artifact and Art can be found along all spectrums. For example Carol Bove has used shelving to make collections of books and photographs into presentations of artifacts as Art. Before her intervention the books are simply material objects that can be activated by reading them... but in her case the art making is a privileging veneration that makes them unavailable. 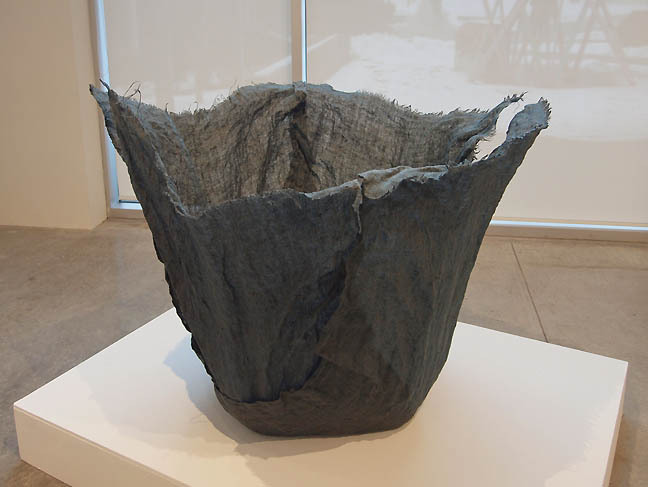 This month, two exhibitions present a series compelling ruminations on art objects as artifacts and material with John Brodie's Versus Artifacts at Linfield College and F&D Carter's Wait and See at Blue Sky. There is always a lot of hand wringing when generations hand the baton and in this case Gen X and Millenials are taking over as patrons and visitors to museums (Gen X was missed by the article, mistake... Gen X is far more museum friendly than Millenials because my generation like to go off and contemplate "alone"). The thing is the Baby Boomers never really distinguished themselves the way their parents did, so though they may have 70% of the disposable income they are likely spending it on their bucket lists and golf outings. Considering how much more culturally sensitive and less "me" centric Gen X and Millenials are museums should be fine in the future. Though they have made huge strides local museums like PAM and MoCC haven't really captured the imagination of the younger Gen X/Millenial crowd that has flooded Portland. The Peter Doig early works show every young painter should check out. Hell, the old ones might find it worthy too. New MOCA Director Philippe Vergne is moving in a prudent and serious way to re-imagine the museum's programming, with a focus on relevance. I tend to think he will be a better fit wit MOCA than he was with the Dia Foundation as MOCA is first and foremost an urban, West Coast laboratory that doesn't program like East Coast institutions do. The West Coast is closer to Asia out here and the more you look the more it shows. Hyperallergic thinks that US museums don't want comics. I don't think that is completely accurate, especially on the West Coast where most major museums have staged major shows involving comics (for example, PAM's big R Crumb show)... but it is true, they might not really know what to do with them when outside of featured exhibitions. Are they prints, books, design driven craft/pop art? YES! The heirs of Peggy Guggenheim sue the Guggenheim Foundation. This is very complicated but I tend to agree with the heirs... basically turning Peggy Guggenheim's burial space in Venice into a rotating exhibition space for collectors who donate enough just doesn't work. Toyo Ito wins the Thomas Jefferson Prize for Architecture. What happens when a civic sponsor witholds funding to shape the programming of a festival, the Artistic Director of the Adelaide Festival responds. There is a line that patronage should not cross, especially if it is a civic organization. Vanessa Renwick is this year's Bonnie Bronson Fellow... congrats. The award is the only one in the region that frequently focuses on mid career women and there is generally a community component that drives the selection process as well. PORTstar Amy Bernstein was on KBOO radio last week discussing her solo show. Last but not least check out David Pagel's review of Walead Beshty's work. William Pope. 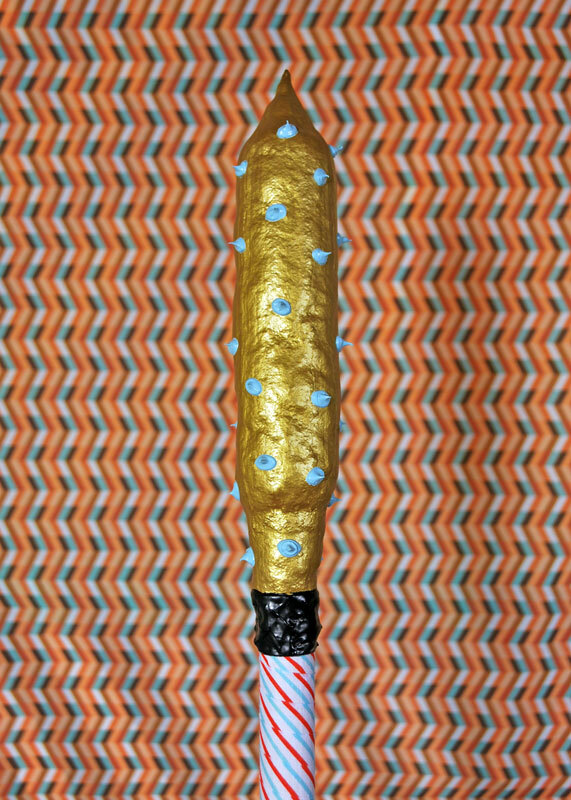 L's work engages, even embraces the absurdity of race and in February 2014 returned to Portland for his exhibition Claim at PSU's Littman Gallery. It was a reprise after 2003's legendary exhibition, eRascism, at PICA. With its rotting onions and hot dogs, eRascism was one of the most memorable exhibitions in Portland history so PORT sent Gary Wiseman to query Pope. L about his practice and his sequel in Portland. Gary Wiseman: Why did you choose to revisit Portland in 2014? For some reason the timing feels significant. William Pope.L: I think returns, like endings, are always significant in some way and my return to Portland is particularly pleasurable. 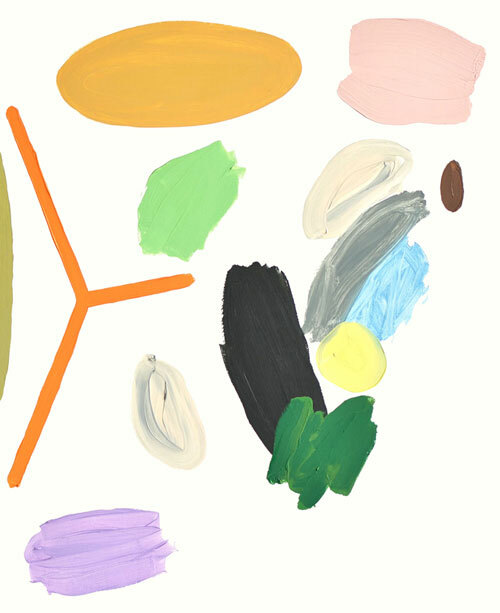 This Weekend, Lumber Room opens Polly Apfelbaum's Color Stations Portland. Apfelbaum is internationally noted as a colorist who starts with a few simple rules, which then are improvised upon as installation to create a structured aesthetic zone. It is very Epicurian in the true philosophical sense and rehabilitates some of the less desirable aspects of Greenberg's Formalism. Overall, the way she develops structure sets her improvisational approach apart, something any top Jazz musician also has to develop. Calvin Ross Carl is a Portland based painter who has been developing at a steady rate for the past few years and has deserved an unfettered solo show for quite some time. Well, Ditch projects is making it happen by presenting CRC's A Beggar on Horseback. It should be an interesting moment to ponder the tectonic collisions of domestic and civic found patterns (hazard signs, table clothes etc) and painterly texture that CRC has been mining lately. 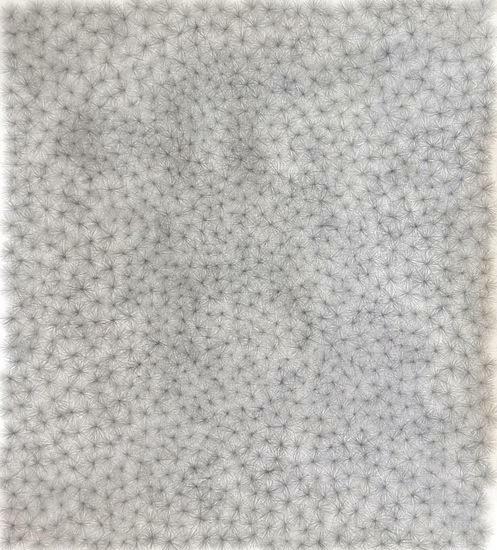 There will also be a group show of drawings called LOOKS ON PAPER. Both should constitute a worthwhile trip to Eugene/Springfield. A look at the Detroit Institute of the Arts bid to separate itself from city ownership. Check out this interview with Carolee Schneemann in the Guardian... Women and their position in the visual arts is turning out to be THE topic of 2014 (especially since the last 12 months have been so dude oriented at an institutional level. 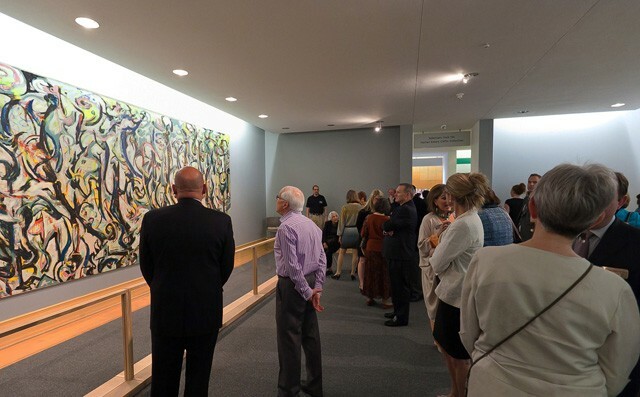 Tyler Green on the restoration of Pollock's Guggenheim Mural. I don't put a lot of cred into the before and after GIF though. I saw the painting in Des Moines before being shipped off to the Getty and it certainly wasn't as dull as the "before" image indicates. The yellows were very apparent but still I'm sure it needed some of the TLC that the Getty was equipped to give it. 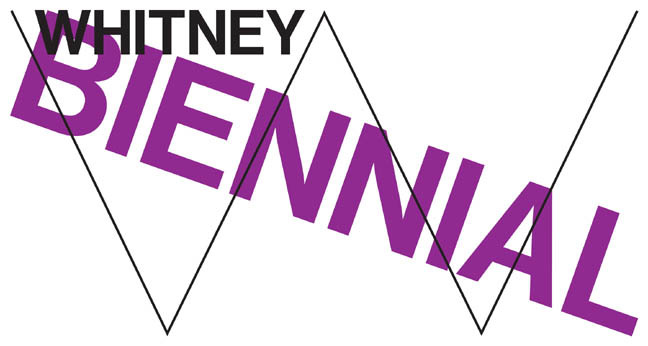 I've updated the Whitney Biennial links several times and its interesting how the Portland2014 Biennial seems to pantomime it. There is a lot of monkey see monkey do when most curators do survey shows, which is why having a kind of thesis like the Hammer's Thing or the Tacoma Art Museum's last NW Biennial focus on interdisciplinary art make sense. Otherwise you see the same show (better and worse versions) over and over again. I still believe these shows are important social events but unless they take a stance and make a point of really highlighting strong new developments in art (with enough space/focus to do so) these things are just anonymous vehicles designed mostly to benefit the presenting institution. An art historical thread like Robert Storr's focus on the grotesque in 2004 at Site Santa Fe meant something... Kara Walker even debuted her first video piece there. The 1999 Oregon Biennial redefined art in Oregon and introduced 4-5 new stars to the scene. That is the sort of discovery that makes a survey memorable. Presenting artists or art that looks just like hundreds of other recent shows just doesn't differentiate the exercise of a survey enough. Women In Art for 2014? Yesterday was International Women's Day and the New York Times published a stunning article on the lack of women in top museum director positions. To be sure there are a variety of reasons but it also follows related but dissimilar gaps in representation for women in all aspects of the art world. For example the current Whitney Biennial (which I've been following with updates here) only can claim only 32% of its participants as women. Closer to home we've pointed out that the Portland 2014 biennial is also short on female artists and no woman has ever won the Arlene Schnitzer prize for the CNAA's. Also, women are still a minority in the Hallie Ford awards. Jen Graves pointed out the stunning shutout of women from the Betty Bowen awards last year too. This is despite the fact that a majority of cultural gatekeepers in Portland (curators and gallerists) are women and I think it might be part of the reason more men get awards. We have waited an incredibly LOOOOOOOONG time for PORT's own Amy Bernstein to do a solo show of her paintings but on Sunday it will finally be here with Notes at Nationale. I can safely say she's obsessed with possibilities and permutations of meaning... and I don't think there is a distinct difference between the visual moves of painting and the meaning of words in her world. She moves between the two fluidly but never really settles. Perhaps the visual and language are two sides of the same coin, one which always comes up heads as she keeps tossing it? She's one of Portland's best painters and really pushes herself hard. This March looks like a particularly strong series of exhibitions. 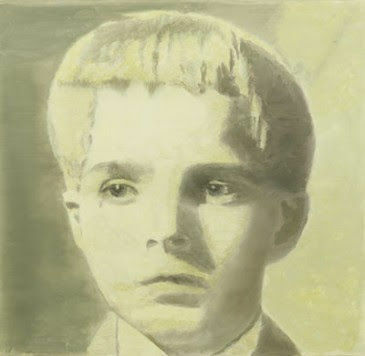 The top pick for this month has to be Belgian artist Luc Tuymans' print exhibition at PNCA's Feldman gallery. 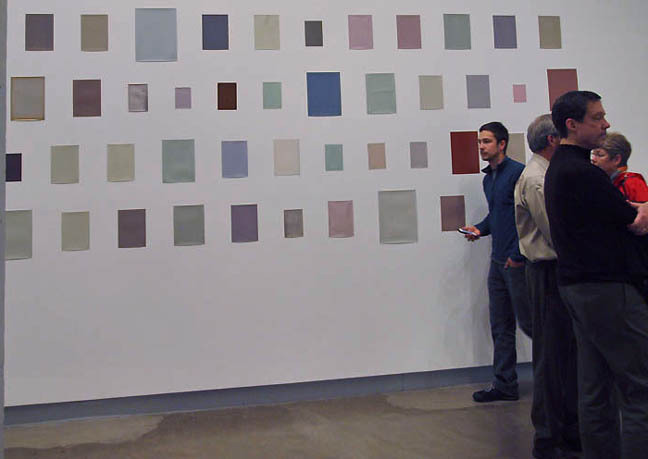 Curated by Mack McFarland and Modou Dieng the exhibition titled, Luc Tuymans: Graphic Works - Kristalnacht to Technicolor gives Portland an in depth chance to take in this politically provocative artist. Previously, we have only seen a stray painting or two at PAM. PORT interviewed Tuymans a few years ago here. Of all the artists that PDX represents I've always thought that Wes Mills best exemplified their quiet aesthetic. Mills himself absorbed a lot from direct contact with the great Agnes Martin and Richard Tuttle and this latest show, Hamilton Drawings, stems from a consciousness changing (and potentially dangerous) incident while hiking in Oregon. We are glad he is all right but this exhibition has us seeing stars too. Well the Whitney Biennial has opened and the reviews are starting to come in. I'll track them here, so check back for updates. Thankfully or sadly there are no Portlanders in it this time but with its focus on the midwest I understand... Portland is very popular with midwesterners as a relocation spot and we have already had a lot of presence in recent previous shows. I'm personally over these giant surveys that always do more for the institution than the artists or the discussion of art (though the flailing attempt to do "something" is nearly always worthwhile as an institutional barometer rather than satisfying/challenging statement). Not to say they can't be good, they often seemed rigged to mildly placate, rather than discover and promote new talent by giving the uncertainty of the present a voice. Instead, they ingratiate themselves to the art world choir creatures they serve (artists and gallerists) and or keep at arms length. Ideally, they spotlight some new faces and trends that keep things from being stagnant... not certain this one achieves that goal. I haven't heard the word "fresh" much. Jerry Saltz found it bland with some energy on the 4th floor. I think this is an amplitude problem... ie. how to achieve escape velocity for an art world exerting such gravitational force, especially in NYC? It incentivises a kind of bland punting (choosing 3 outside curators etc, I discussed it yesterday). It is very predictable because so much is at stake and anything embracing the radical becomes a massive threat. NYC's art world is easily threatened these days. Accepting threat or the uncertainty and amplifying the shifts that the unknown demands is a far healthier way (an essay I penned in 2002 that Jerry liked a lot gets to the point). Also, Jerry may love the camera obscura(curated by Elms) but I've seen so many of those over the past decade + it just seems like it stood out because it was a reprieve from the anxious index of familiarity he described in the rest of the show. Interesting that he liked Sterling Ruby's ceramics... a similar vibe to the 2012 standout by Portland's Jessica Jackson Hutchins... both are steeped in West Coast 60's arts and crafts grottyness. Tyler Green looks at the coming absorption of the Cocoran's collection into the NGA's and what it could mean. Robert Storr, Dean of Visual Arts at Yale will be giving his lecture, Kara Walker: Shadow Caster at the University of Oregon, on March 6th at 6:00 PM. 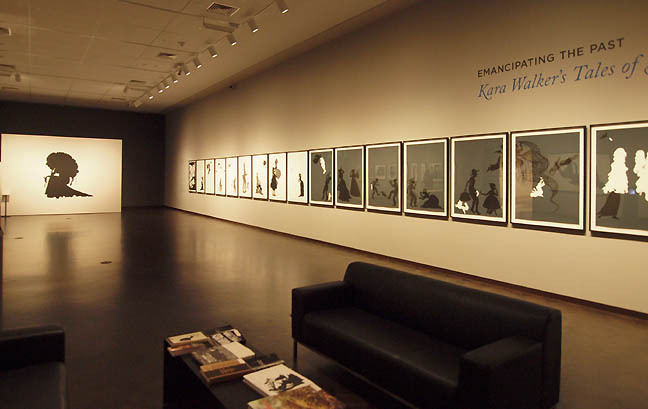 The school will live stream it, but you should absolutely try to see their on campus exhibition, Kara Walker: Emancipating the Past at the Jordan Schnitzer Museum of Art. As you can see... it is very different and executed far better than the Walker show at Reed in 2012. The install is spacious and the video work, "National Archives Microfilm Publication M999 Roll 34: Bureau of Refugees, Freedmen and Abandoned Lands: Six Miles from Springfield on the Franklin Road," at the JSMA is perhaps my favorite of her video works. It is a must see and bound to be one of the best shows of the year in Oregon. Besides being perhaps the most accomplished academic/critic/curator combo on the planet, Storr has a special window into Kara Walker's work. He curated the 2004 Site Santa Fe Biennial, "Disparities and Deformations: Our Grotesque," which included Walker's first video. I was there when it was unveiled and Storr's grasp of history as a continually evolving grotesque makes him better at talking about Walker's work than Walker herself (that isn't a slight, I'm very sure she'd rather not talk much about it and just let its subversions and ugly truths operate visually but no artist gets to do that).